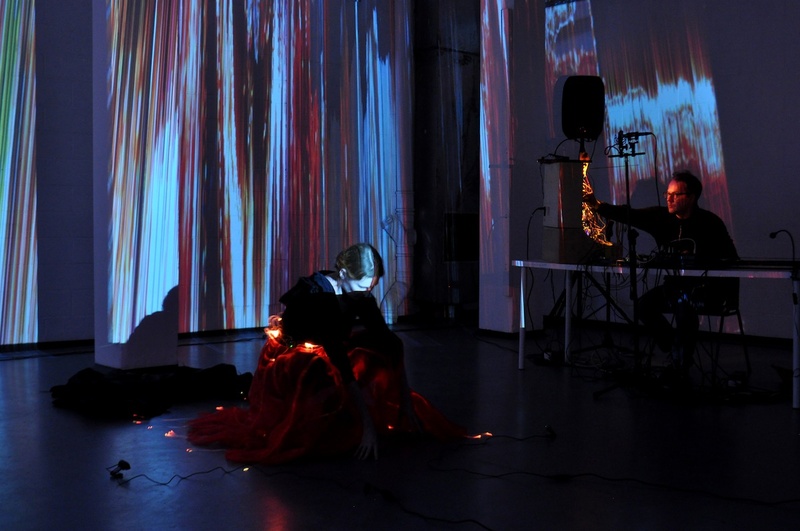 Ember, EL Putnam and David Stalling, a co-production with the Complex, performed at the Ground Floor Gallery on 21 December 2017. Photographs: Paul McGrane. On a dark, cold night, after sunset on the Winter Solstice, I sought refuge from the masses of Christmas shoppers at Ember. Consisting of performative gestures, sound, lighting and digital processes, EL Putnam and David Stalling’s collaborative two-hour performance at The Complex offered the space to contemplate the enigmatic rhythms of the solstice and the interplay of human connections. 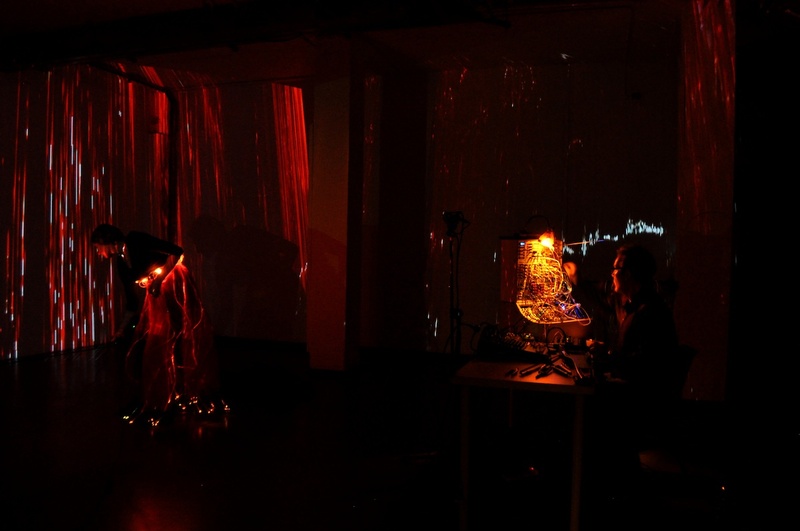 Interconnections and interruptions ran throughout the durational performance. 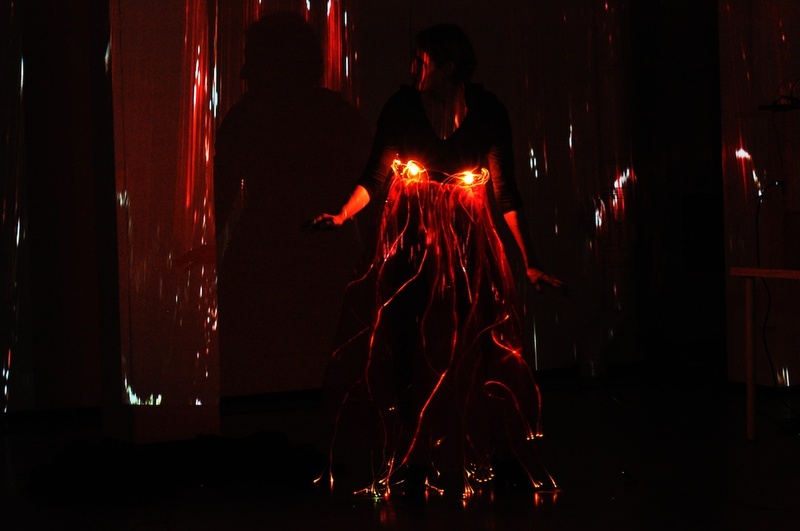 In a red skirt with sewn fiber optics, Putnam performed slow, expressive gestures while twinkling orange and red lights swirled gently around her. The crackling sounds of a fire produced by Stalling as it popped and hissed heat furthered the suggestion of glowing embers impressed by the lights and the title of the work. The sounds transitioned into something more abstract, remaining familiar, yet elusive, like smoke and ash escaping on the wind. 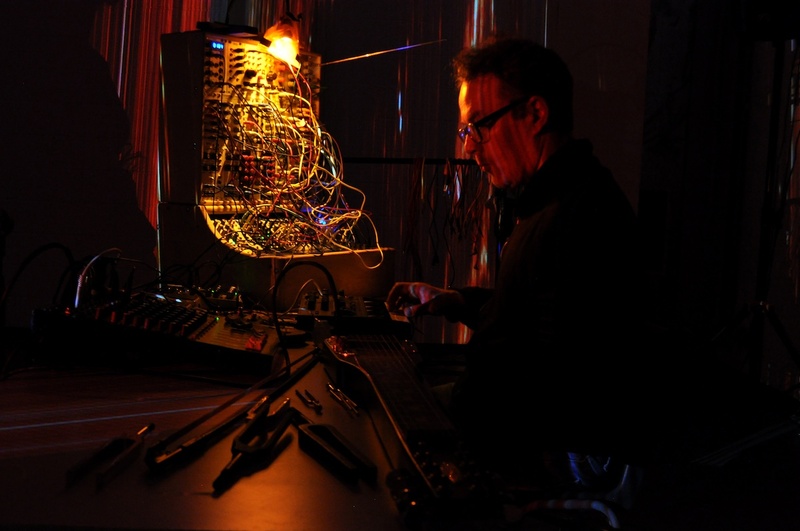 The mass of wires that emerged from Stalling’s upright synthesizer, lit from above by an amber light, were equally as sculptural as Putnam’s gestures. While I pondered these visual similarities, it struck me that though there were evident shared artistic concerns, deeper corporeal connections ran throughout the work. Putnam held two web cameras in her hands, aiming them at her abdomen, suggesting the artist as maternal subject. The footage was translated live through a computer programme that mimicked slit-scan analogue photography. 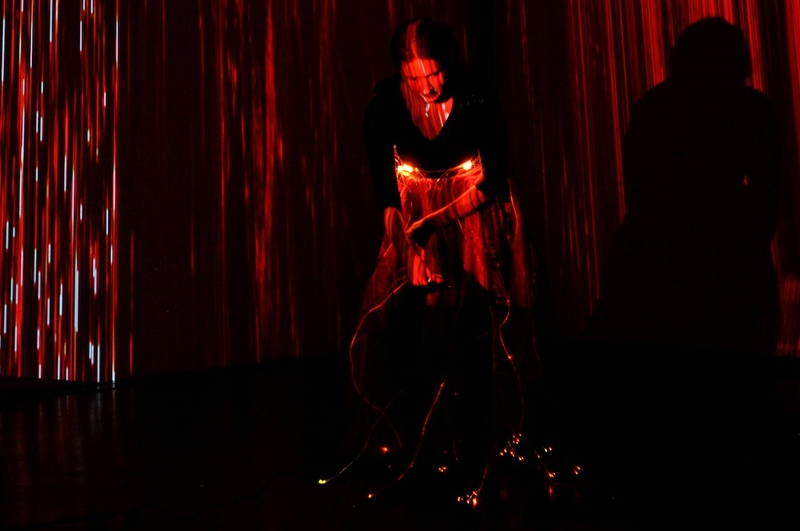 This resulted in distortion or interruption of the subject, producing a large, red digital glitch projected against her body and onto the wall, layering digital body upon physical body. Stalling’s tuning fork struck against his knee and, held close to a microphone, produced a sound that translated into a loud ringing in my ear, resonating throughout my entire body. It became necessary for me to disrupt its intensity by sticking my finger in my ear. Meanwhile, Stalling’s sounds continually defined the space around Putnam’s body and responded to her movements. While speakers physically marked out the performance space, his microphones captured how the sounds were projected around the space, moving against and reflecting the room’s architecture. 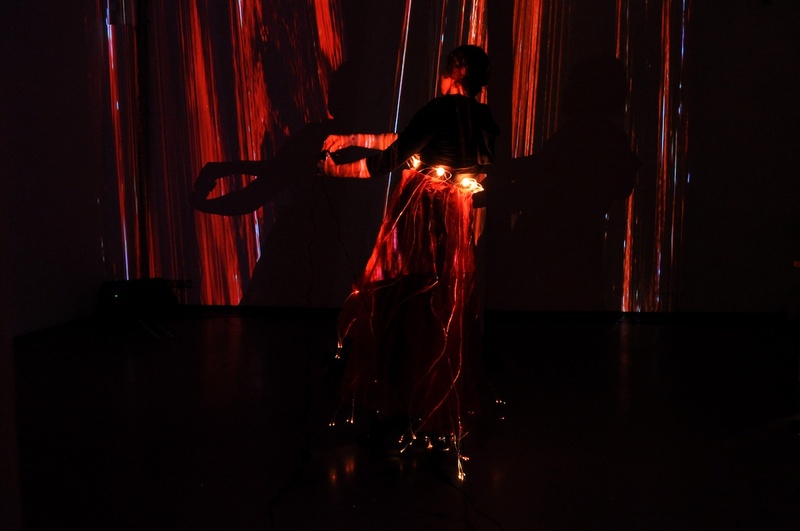 The different projections of visual, digital and sonic bodies in Ember articulated moments for introspection and reflection on the embodied connections between subject and viewer. Dr. Kate Antosik-Parsons is a Dublin-based art historian and research associate of the UCD Humanities Institute who writes about gender, sexuality and embodiment. Website.